Hmmm, curtains for your sewing room? The Target-curtain dress done sleeveless for summer? An early 80s wrap skirt? That magenta, turquoise, and lavender border print one would look amazing as a Stunt Poodle Skirt kind of dress! Imagine applique-ing on a length of actual measuring tape. Im guessing that by the end of the day there wont be any of that fabric left! thanks! I picture a butchers apron for while you are sewing! So cute! I hope you post a pic of the final dress. I am on a shirtdress making frenzy. Although I am only using two patterns. I dont have the patience to alter patterns. I just want the dresses–Now! Those border prints are very lovely. This fabric is lovely, and I agree that the colourway is very 1930s. 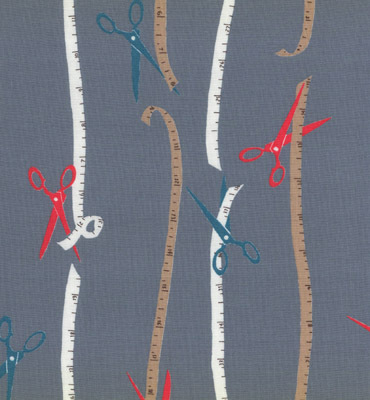 $9/yd is a fairly reasonable price for Yuwa fabric… and those border prints are lovely.